Interest in local agriculture is spurring a growth of small organic farms in Ulster County that are accessible to you as a guest at Emerald Forest Bungalows. We can allow you access to an online ordering system that allows us to deliver local, organic produce, eggs, chickens, (and soon goat cheese) right to your bungalow fridge. Rusty Plough Farm: Just up the road, Nadia and Oleh Maczaj have been organic farming for about fifteen years. Every year the farm has more members. They grow a large variety of lettuces, radishes, carrots, onions and garlic, heirloom tomatoes and flowers. They also have about 30 hens, so in the spring and summer, eggs are plentiful and available to our clients. You can order from them online and have organic produce delivered to your cabin's door! Place orders from Sunday to Tuesday night for Friday delivery. August Farm: Tom and Madeline DePuy have expanded their garden into a small business and have already gained a reputation for the best organic potatoes in Ulster Heights! Farm and Granary: Is using an extensive greenhouse system to extend the growing season and they have some of the best eggs in the Hudson Valley. Escot Valley Farm: Is now offering organic pastured chickens which we can have delivered to your bungalow. 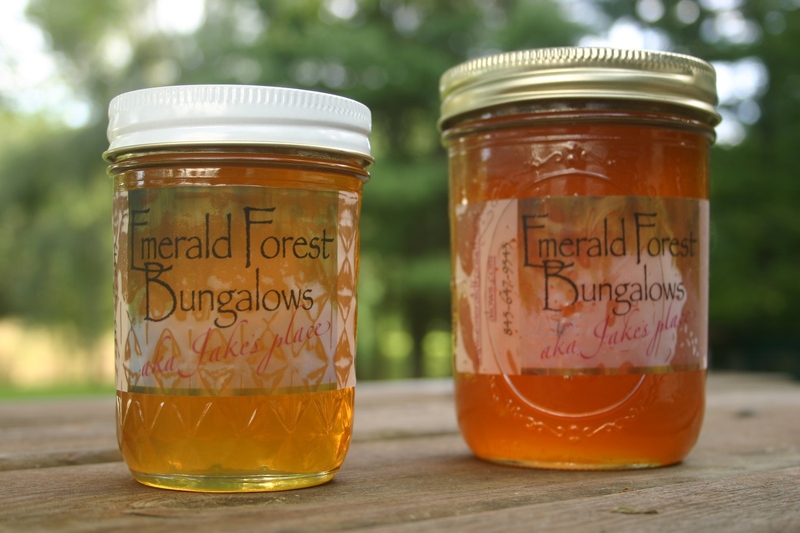 Honey: You can also watch honeybees doing their thing right here at Emerald Forest Bungalows. Our three hives are producing a good amount of honey this summer which we just harvested and is available for sale.